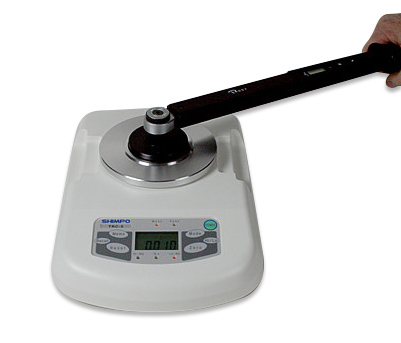 The new SHIMPO TRC torque checker is a user friendly instrument for calibrating or measuring torque values. A single button process does it all. Zero, Test, Store, and repeat. In addition to Average, Maximum, Minimum, and Peak values, the TRC features Red/Green/Red LED's (HI-GO-LO) and audible alarm. It's wide 3,000 data points storage capacity makes large batch testing possible, insuring overall product quality. The TRC is a portable device powered with internal rechargeable batteries or through a universal AC adapter/charger. The TRC's small foot print saves valuable lab space. It's low profile, (3.82") rugged design, and NIST traceable calibration certificate promotes proper calibration procedures, insuring overall product quality. Includes Factory Certificate, CE Approval and 2 Year Warranty! TRC-5 Digital Torque Tester, Range of 0-44.25 in·lb (50.99 kg·cm, 500.0 N·cm, 5.000 N-m) - Please contact us for pricing and availability.